This Hinkley Felix 6 light pendant ceiling light in sunset gold finish features designer style and flourishing laser-cut metalwork that creates a stunning feature. With circular ceiling plate and chain leading to a secondary plate, with four chains holding the circular frame. 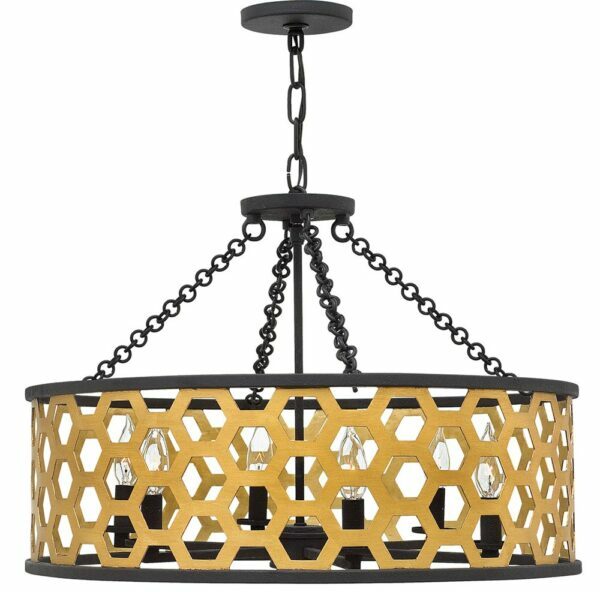 The framework features an outer laser-cut honeycomb band in sunset gold, with top and bottom hoops in textured black. A six light candelabra hangs inside, with candle style lights on radiating spokes. Finding design inspiration for a modern interior can be a daunting task but it doesn’t get easier than this. The bold honeycomb, hexagonal pattern of laser cut steel in a winning two-tone combination of sunset gold and textured black make this ceiling light suitable for a variety of interior styles. Supplied with 305cm of chain that can be shortened at the time of installation, please see the technical data below for minimum and maximum heights. There are matching fittings available in the Felix lighting collection; please see below. Supplied by Elstead Lighting and designed in the USA by Hinkley Lighting, founded in 1922 in Cleveland, Ohio. Their long heritage combines with a pursuit of innovative design to create modern and contemporary lighting such as the Felix 6 light pendant ceiling light in sunset gold finish featured here.